Los Angeles Dodgers Beat Houston Astros 3-1, Extend World Series to Game 7 : The Two-Way Houston missed a chance to nail down the franchise's first Series title. The teams meet for the deciding game Wednesday night in LA. The Los Angeles Dodgers pour onto the field after beating the Houston Astros in Game 6 of the World Series. 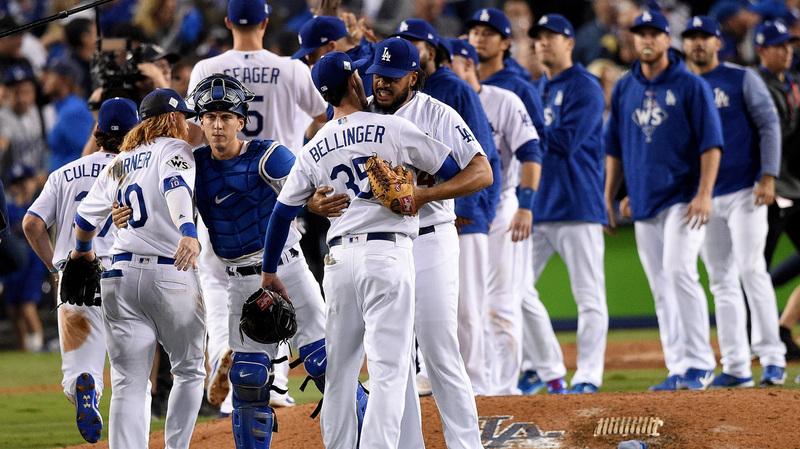 The Los Angeles Dodgers beat the Houston Astros 3-1 in Game 6 of the World Series, evening the best-of-seven series at three games each and guaranteeing a Game 7 on Wednesday at Dodger Stadium. The Dodgers had trailed 1-0 until the bottom of the sixth inning when catcher Austin Barnes singled and Houston starter Justin Verlander hit L.A.'s second baseman Chase Utley. Center fielder Chris Taylor doubled to score Barnes. Shortstop Corey Seager's sacrifice fly scored Utley. Until then Verlander appeared to be in control of the game, holding the Dodgers to just one hit in five innings. The Dodgers added another run on a home run by left fielder Joc Pederson in the bottom of the seventh inning. 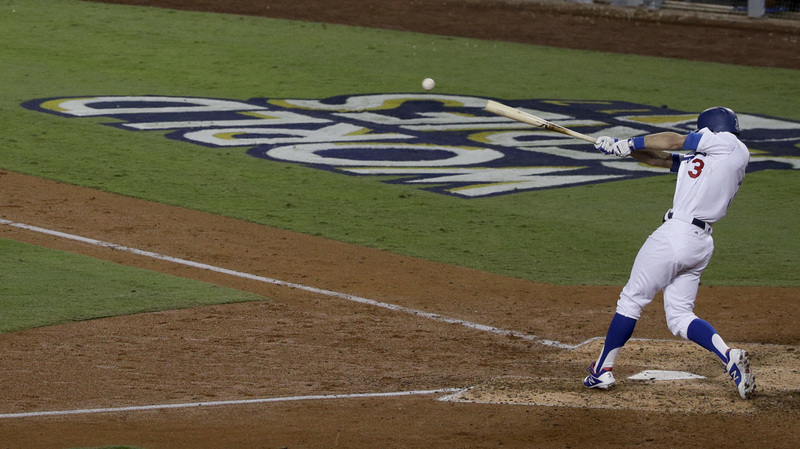 Los Angeles Dodgers' Chris Taylor hit a RBI double off Houston Astros starting pitcher Justin Verlander during the sixth inning of Game 6 of the World Series Tuesday. For Houston, Game 6 was about their failure to capitalize on opportunities to get on the board. 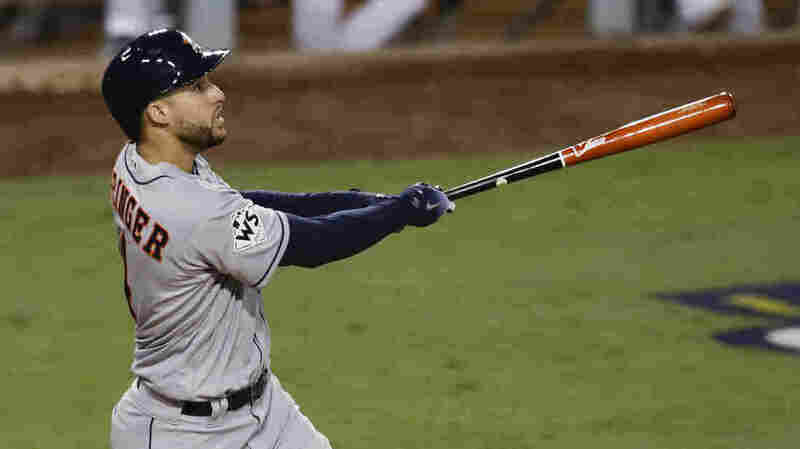 They scored their only run when Astros center fielder George Springer hit a home run off of Dodgers starter Rich Hill in the top of the third inning. Houston Astros' George Springer opened the scoring in Game 6 with a home run off LA's Rich Hill at Dodger Stadium. The Astros threatened to score in their half of the fifth, sixth and seventh innings, but each time they came up with nothing. In the top of the fifth inning, they had runners at second and third base with no outs after a single by catcher Brian McCann and a double by left fielder Marwin Gonzalez. Two outs later, and with an intentional walk to Springer loading the bases, third baseman Alex Bregman grounded out to short. In their half of the sixth, the Astros got two runners on a two-out single by first baseman Yuli Gurriel. Then McCann was hit by a pitch from Dodgers reliever Brandon Morrow. But again, Houston failed to score. Houston put two more runners on base in the seventh inning on a walk by right fielder Josh Reddick and an infield single by Springer. But the Astros couldn't get a timely hit after that, leaving a total of eight runners on base. Each of those scoring threats were stymied by the Dodgers relievers who combined for 4 1/3 scoreless innings after starter Rich Hill went 4 2/3 innings. Reliever Tony Watson was the game winner and Houston's Verlander took the loss, his first since being traded to the Astros in late August. The Dodgers colorful right fielder, Yasiel Puig, had guaranteed that the Dodgers would win Game 6 and force a winner-take-all Game 7. The starting pitchers for Game 7 Wednesday night are Yu Darvish for the Dodgers and Lance McCullers for the Astros. Darvish pitched poorly in Game 3, lasting only 1 2/3 innings. McCullers was the victor as Houston won that game 5-3.